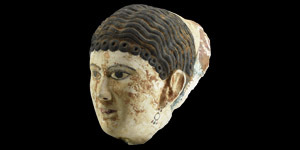 A female gesso face mask with wavy hair and a fringe of curls, applied black pigment detailing to the eyebrows, eyes and nostrils, red to the lips; palla headcovering to the rear of the head with red and green painted ornament; mounted on a custom-made stand. 4.48 kg total, 42cm including stand (16 1/2"). Fine condition. Acquired by the current owner in 2008 from Aton Gallery, Paderborn, Germany; formerly in a German private collection since the early 1980s.